I had a fantastic weekend! The sun was out, the temperature was quite nice, and the weather was fantastic all weekend! I got in a couple of great runs, and some workouts besides. All told, the weekend couldn’t have been better! So, of course, just to make sure that I meant it when I said it, the people in the apartment above me spent the entire night dancing on the only squeeky board in their apartment. And when I say all night, I really mean all night! My wife and I actually looked at each other at 2:30am and asked “Should we go up there?” Honest to god, I am not sure if they brewed several pots of coffee to stay up and dance on that floor board or not, but they did it clear through the night! Needless to say, this morning I was in need of some serious comfort food. But, perhaps even more importantly, it needed to be something to help fuel me through the day, not something to give me a brief sugar-high so that I can crash at 10:00am. Without a full night of sleep, I know better than to think that I can recover from a sugar crash today… It just isn’t going to happen!! One note: You may or may not have noticed the questions that I’m posing at the end of some of my posts now. Since you all are reading and commenting regularly, and it’s helping to keep me motivated, I have decided to give you a little something back: help me to understand what things you’re looking for, and I will try to respond! First chop and saute the mushrooms in the Coconut oil on just under a medium heat, about 4 out of 10. These take the longest to cook, so start them first. Also, this is a great time to add about half of the rosemary that you’re going to use. Save the other half for when you add the zucchini, later. While the mushrooms are sauteing, chop up the zucchini. Stir the mushrooms every minute or so. After about 5 minutes of cooking add the zucchini and the rest of the rosemary. At this point, turn the heat up to about 5 or 6, or just over medium. You want the zucchini to crisp a bit, but you don’t want it to soften much – the flavor is great when it’s browned, but it’s harder to cook with when it softens. Stir regularly for about 2 minutes. 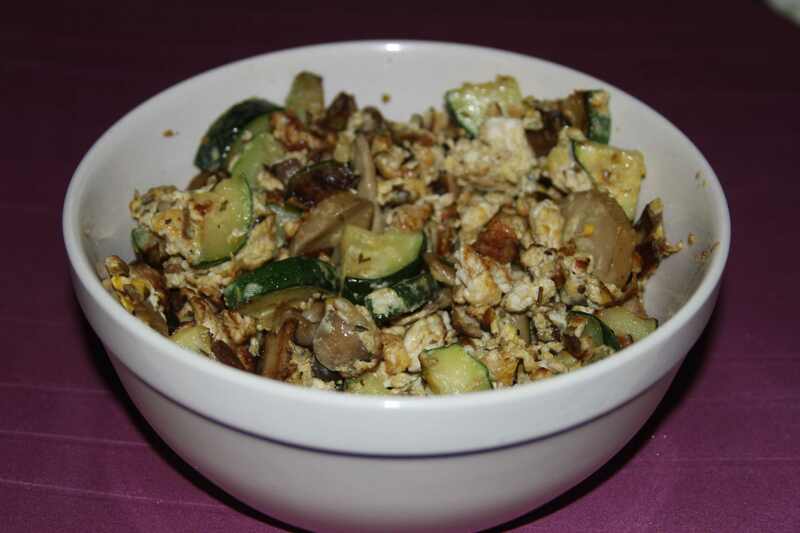 At about 7 minutes of cooking total, or 2 minutes after you added the zucchini, go ahead and pour the eggs in over the top of the zucchini and mushrooms. As I have mentioned previously, I don’t pre-mix my eggs when I’m making scrambled eggs. There are a variety of reasons: I don’t see the benefit, I think that they’ll all be mixed up in the pan anyway, so why bother pre-mixing, I like the coloring of the yellows and whites, which you lose when you pre-mix. I think that’s enough reasoning for now, but if you pre-mix, that’s fine too – just be ready to add the eggs on time. On top of the eggs, you can add the rest of your spices. At this point, you can turn the heat up to about a 7 out of 10, letting the eggs cook very quickly. And make sure that you’re stirring constantly to keep the eggs from burning or sticking to the pan. There won’t be any coconut oil in the pan to make that easier for you – so be proactive and keep the eggs moving! I like my eggs well done, so I cook them until the eggs are starting to brown slightly. The extra flavor is something I find quite satisfying, and fortunately, my wife likes her eggs that way too! Once the eggs are cooked the way you like, go ahead and serve them on a bowl, or in a plate. If you need a bit more fat with your meal, this will go really well with some avocado! What’s a typical breakfast food for you? How do you like it prepared? Why do you like it that way? What breakfast foods are you looking to try, but haven’t yet? And what is the hold-up? I have had the same problem with noisy neighbors upstairs… Mine get active at around midnight, scraping furniture around and what sounds like wrestling body slams and so on… More reason to stay strong with a healthy diet! Ugh! It’s soooo annoying! But you are SO right – all the more reason to stay keyed in on my health!! Thanks Paulin! I really enjoy mushrooms in a lot of things – they often have a very subtle flavor, and are great for soaking in other flavors! ← How Do You Fuel The Fire?